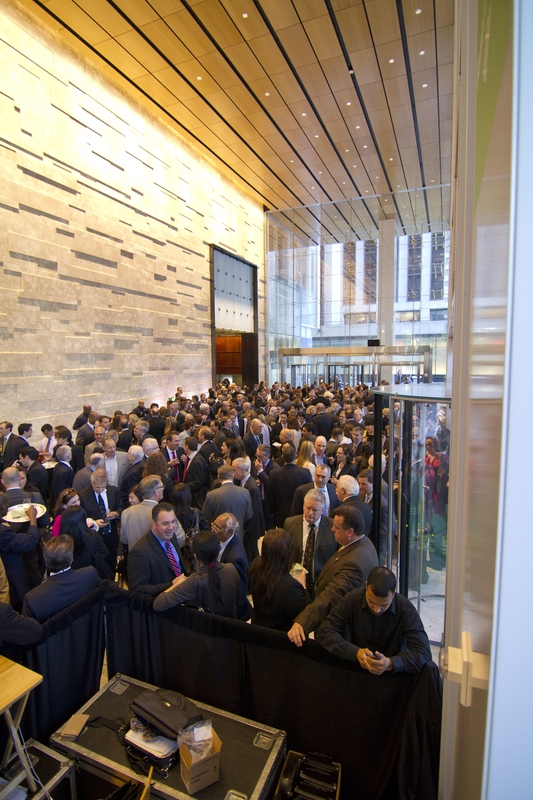 At 6:30 PM, Thursday May 20th, the lobby of the Bank of America Tower at One Bryant Park was filled with hundreds of people clad in business casual attire. With 8,000 employees regularly shuffling in and out of the 55-story skyscraper, passersby might have assumed that the hub-bub merely signaled the end of another workday in the building which has been officially operating for 2 years. Instead, the crowd inside was composed of hundreds of people that literally helped to build the tower—a fraction of the team of thousands involved in the intensive six year long building process. Needless to say, the flutes of local sparkling wine passed about were long-awaited and much deserved, with laughter heard and warm embraces shared amongst those that had formed friendships after years of collaboration. The building gives back to its tenants; air filtration removes 95% of particulates, making the air inside cleaner than outside, and creating a healthy workplace that boosts worker productivity and happiness. The tower also gives back to New York City. A newcomer to an impressive skyline of historic skyscrapers, the Bank of America Tower’s contribution is unique—as a result of its construction, New Yorkers enjoy widened sidewalks, improved sightlines and views, and the City’s power grid gets a break due to the installation of a co-generation plant and a thermal storage plant that creates ice during off-peak hours, reducing daytime demand on the grid. 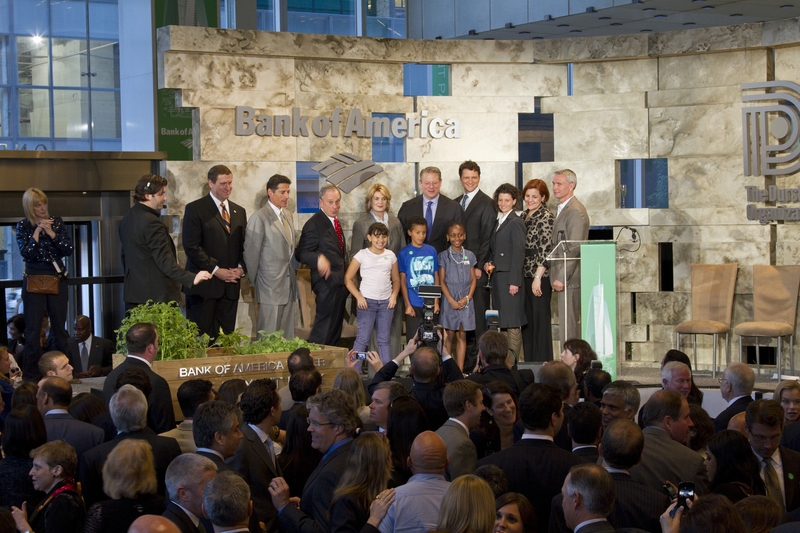 Last night, the Bank of America also gave back to the youth of New York City in the form of a $125,000 donation to 100 schools to plant gardens. The announcement was happily received by three schoolchildren from PS 43 in the Bronx who arrived on the stage toting small plants. The true significance of the event was memorialized in one of the more sobering remarks made last night by speaker Al Gore, a tenant of the building. He mentioned the comprehensive reports issued by the National Research Council on May 19th that stress the need for the United States to develop a strategic plan to address climate change. 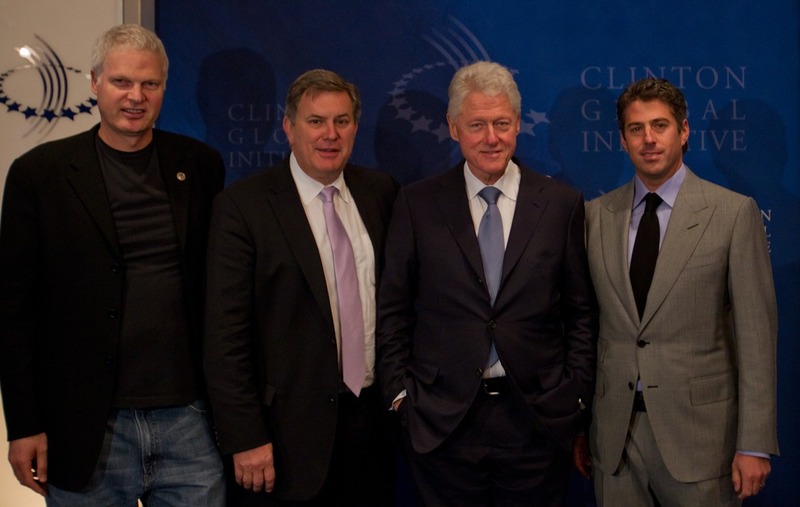 Specifically, Gore cited the fact that “30% of CO2 emissions in the United States come from inefficient buildings.” Despite the glamour of the event, the true intentions of all attendees and project leaders present were clear: taking real action to address and reverse these global concerns. 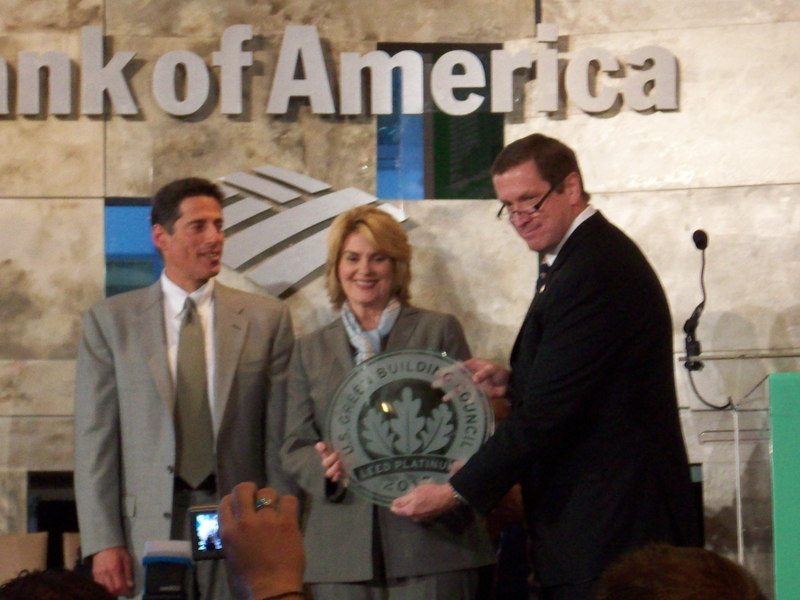 Although the Bank of America Tower is one LEED Platinum skyscraper, in just one of America’s large cities, it certainly won’t be the last. With any hope, its completion serves as a tipping point, with many others closely following its lead and even surpassing its pioneering standards. All Images credited to Cook+Fox Architects. Alisa Ahmadian recently migrated to New York City, where she will begin work shortly for Cook+Fox Architects. In her past life in California, she was an environmental activist, a UCLA student and a vegan foodie. >Earth Awards, Calling All Entries!